...A great one will help his batty enemies. Solonius Rex demonstrated unquestionable generosity by giving a gift to one of EVE-O's battiest bot-aspirants. In doing so, Solonius also helped fund the New Order's gankers. What a guy. Instant karma: At the same time Solonius was helping his enemy and all highsec, he earned a Supreme Protector's Tip of the Hat™ for himself. Solonius' purchase of 300 additional shares of New Order stock took us past the 1,587 billion isk mark. Folks, you can't make this stuff up. The so-called Anti-Gankers used to say that Agents only inspect and confiscate ships belonging to newbie players. But is that true? 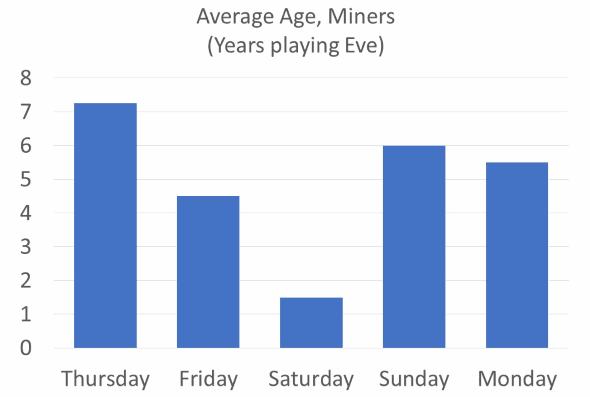 New Order Logistics has been running fleets every day for the last five days, and I have collected the age for all miners that have failed their permit inspection. The average age has been 4.6 years, which is far from being newbies. Included is a graph for the average age for the last five fleets. "Newbies" indeed. It's incredible to think that people can be so bad at EVE after so many years in the game. 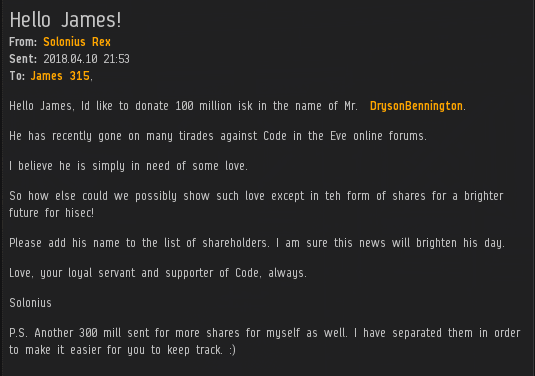 Even more shamefully, they sputter about "newbros" and "CCP revenues". And they wonder why we gank them? Hello pilots of New Eden! As we have in the past, the CODE. alliance is running a venture killing contest for 2018! The event will be starting today and run till May 31st where we will hand out prizes to the winners who kill the most ventures in Highsec, make the best Video killing them or kill the biggest pod (that was in a venture). There will be 5 prizes, 3 prizes for most killed, 1 for best video and 1 for biggest pod. The prize pool will be increased over the contest period with donations from the generous pilots of New Eden. All Donations to the contest can be sent to Australian Excellence. Make sure you do NOT kill players in the official newbie systems, or risk a permaban! Make sure you have your API setup on Zkillboard for validation! Kills must be different players and suicide ganks in Highsec. Once the competition is over, you count your total of individual kills and send them to Australian Excellence. ALL pilots in New Eden are allowed to participate regardless of what group they belong to! Any attempts to cheat or game the contest will result in that player being disqualified. For more information you can ask in the minerbumping channel ingame or on our Discord! We at the CODE. alliance are happy to bring this fun content to the community and hope it fosters some movement in an increasingly stagnant part of the game. Good hunting friends! I dont know why we dont go on a skiff fleet. There are a lot of rules, but it's better to get acquainted with them before you join the game. Is there any news about the prize fund? You say that it will be increased. Perhaps the latest information has already appeared? Is essay writing consuming all your time and you can’t pen your words properly? Are deadlines pressing in and you fear your draft is nowhere near the UKEssays Writing examples prevailing? British Essay Writers have the solution to all your problems; simply contact us and avail our services while you still can.